In this article I explain step by step how we went about applying a new antislip epoxy floor on a heavy duty food processing factory. 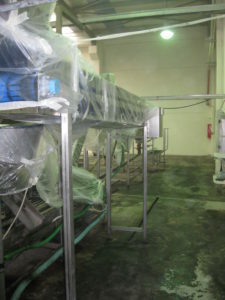 This factory is involved in the production and packaging of olives, which happens to be a very dirty and grimy industry. When you walk in these factories you feel that there is oil everywhere. The slightest mis-step and you can fall flat on your face in a pile of slimy olive oil. So we had to propose to the client a solution that would prevent the concrete from absorbing the oil and also protect the workers from slipping. 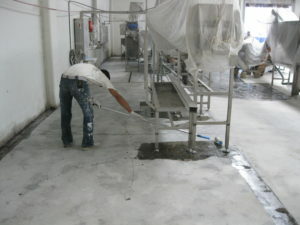 But before we started we needed to deal with another problem: A disgustingly dirty oiled up concrete floor that needed cleaning. Otherwise the epoxy would never bond with the substrate. 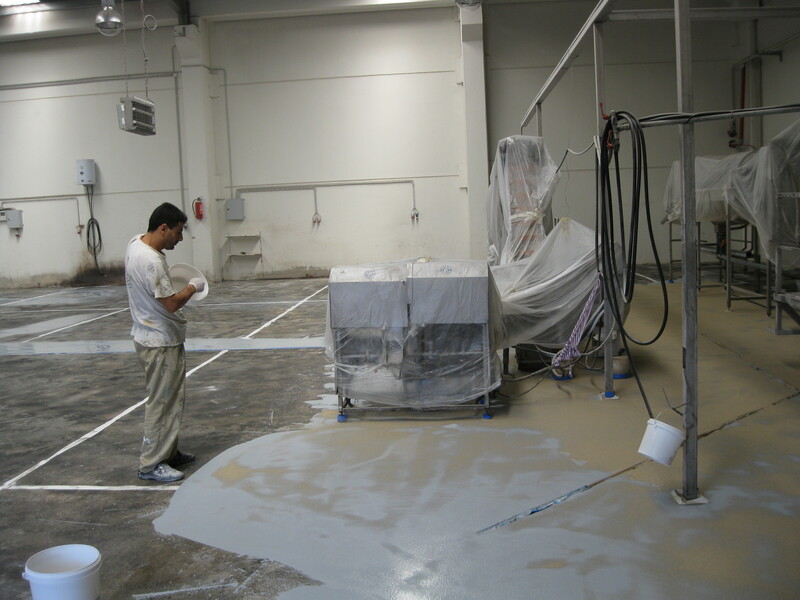 We spent several days cleaning up the floor and once we had achieved an acceptable level of clean concrete we proceeded with the priming of the floor. In fact as this had been a highly damaged floor, we decided to apply a second layer of primer. On top of the second primer we broadcast some light quartz that would help with the bonding of the next epoxy layer. After the primer had dried, we applied the epoxy coating that would form the base of our anti slip coating. 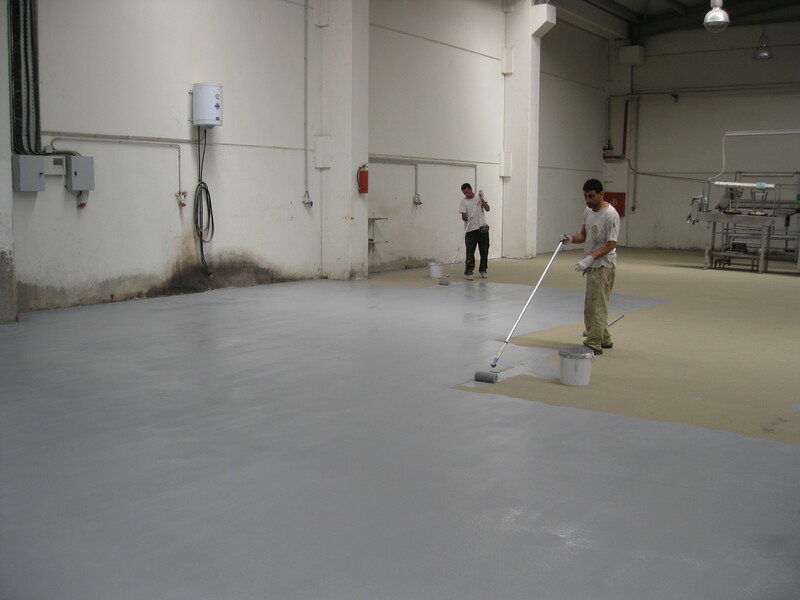 We applied the epoxy at a 2mm thickness with a trowel. 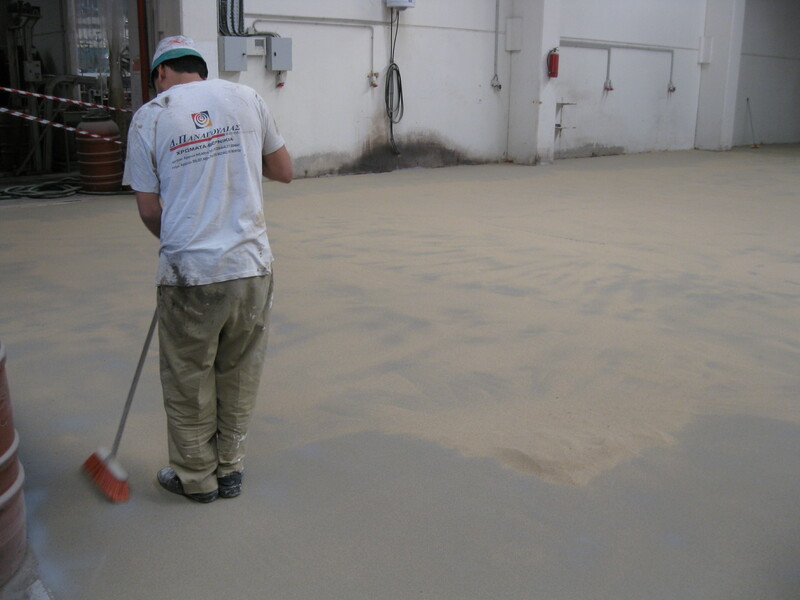 While the base was still wet we broadcast quartz sand granules (0,7-1.2 mm thickness) until the whole floor had been filled. We consumed about 3kg per square meter in order to get a floor filled with sand. Important point to consider: some applicators apply a very thin layer of epoxy base coat in order to save money on the epoxy. However if you want the floor to last in the long term the sand needs to be well immersed into the base and not just floating on top. After the base-coat had dried we had to sweep all the loose sand granules that had not stuck to the base. We ended up filling quite a few bags with sand! Once the sweeping was completed, we applied the epoxy topcoat over the rough sand. We applied the topcoat with a roller and consumption was nearly 3X as much as when applying over a normal flat floor. 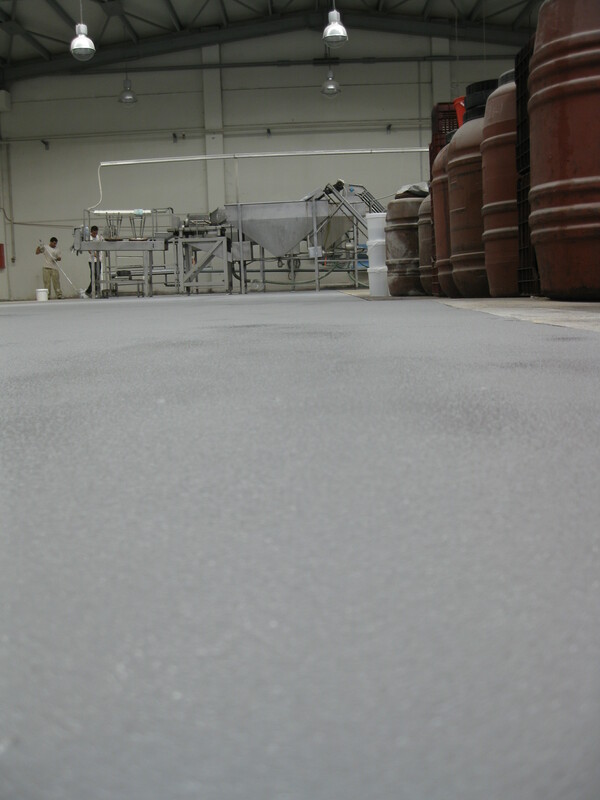 The reason why consumption was this high is because the rough texture of the floor increases product consumption. 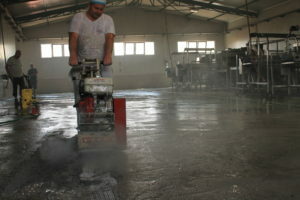 If you want to learn more, don’t forget to watch the video of how we applied the floor!